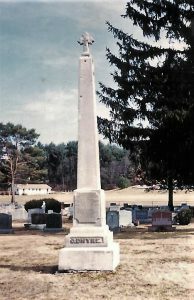 The O’Dwyre monument, photographed in 1998, has not been included on findagrave. In response to my query, an eminent genealogy colleague once advised me that there is little point in publishing information on families with no living descendants. My example here, I hope, counters that point. Tracing the provenance of an inherited mantle clock led me to the Philip O’Dwyre family of Willimantic, Connecticut. Born in Kilchrohane Parish, County Kerry, Ireland about two hundred years ago, Philip O’Dwyre, a true Famine refugee, fled his homeland in 1851. Leaving his infant son Philip and pregnant wife Julia in Ireland, he established a foothold in Willimantic before sending for his family. Philip kept a job working for the railroad and became, as Philip “Daware,” an American citizen in 1856. Willimantic censuses and baptismal and marriage registers from St. Joseph’s Church document the remaining eight children born to the couple. Philip bought several tenements on Valley Street, and the neighborhood became a mecca for other Kerry immigrants. In 1860, the “De Wire” household included Philip’s teenage nieces Bridget and Mary Lee. He thus became the anchor in a chain of immigration that lasted for decades. Philip lived to a respectable old age. According to his death record, he was 77 – in fact, at least a decade older. His obituary in the Willimantic Chronicle on 3 October 1904 recounts that “He was prominent in the building of all railroad lines and was of splendid physique until taking sick about a year ago.” Of course, the obituary makes no mention that he died sitting under an apple tree in his back yard, a glass of whiskey at his side. The Chronicle also noticed Philip’s funeral, “one of the largest in years.” His pallbearers, all Kerry men, included nephew Philip Dwyer for whom the family patriarch had provided a first home in America. The latter, my grandfather’s uncle, moved to Leominster, Massachusetts, where he died in 1917. Completing the family circle of obligation and duty, my grandfather, Michael F. Dwyer, served as Philip’s pallbearer. One would think that, as the parents of nine children, Philip and Julia would have living descendants. Despite stability in Willimantic and dependable income, their family succumbed to the diseases of the time: their two elder sons, both dead at 28, from lung infections, and their three adult daughters from tuberculosis. Philip O’Dwyre Jr., a stonecutter, lived long enough to complete the family’s Celtic Cross monument in St. Joseph’s Cemetery. One side of the monument inscribes the date and place of Philip Jr.’s birth: Murreach, Dromod Parish, County Kerry. Philip got his money’s worth out this twenty-four-grave plot. The other three sides are filled with his children and grandchildren, the last of whom was buried in 1977. Philip’s sister, Mary, wife of James Lee, also settled in Willimantic with her husband and younger children in the early 1860s. In 1900, Mary, having outlived five of her ten children, made her home with three widowed daughters and her son, Jeremiah Lee, a Civil War pensioner who outlived both of his wives. While death certificates reveal physical symptoms, they do not speak to the wounds of scarred psyches. It takes more than a generation to recover from the want and deprivation that Irish families experienced in the wake of famine. An unusual number of adults among the Dwyer kin never married, lived at home with their parents, or experienced childless marriages. Ironically, Philip’s sister Julia married in Willimantic at the age of 40, had only one child, but today she has the greatest number of living descendants. 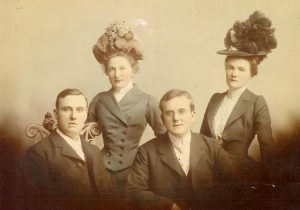 Frank O. Dwyer with his bride, Julia McNamara; William Brady; and Frank’s cousin Nell Hennessey in 1899. Studying Philip O’Dwyre’s family and their kinship network contributed important pieces to the mosaic of my family’s immigration story. They will never become extinct as long as they live in the memories of their collateral relatives. Spelling has been standardized to Dwyer. Philip preferred O’Dwyre as a badge of Irish nationalism. His son Frank kept O. as a middle initial. Good for you! I feel compelled to adopt the lost and the last of a line. They do after all, belong to us, and you never know where or when they will fill in some missing part of our heritage. Thank you for bringing this up! Keli D Levine, I too feel the need to adopt “the lost and last of a line” as well as the left-behind, i.e. Infants and toddlers buried in the place their parents had lived before moving on, perhaps to escape the grief of multiple loss. ‘They will never die as long as someone remembers they were alive’, or something like that. Excellent posting. I share your sentiment that all stories (in particular, those close to the stories of our own family) enrich our understanding of the past. Thank you for saying it so well. Thank you Michael for your remembrance of this Irish family in both their considerable pain, familial love/honor, and contributions to the fabric of America. You’ll be posing their memorials to findagrave whilst enjoying a glass of Irish Whiskey? My first cousin and I neither have children, but of our relatives we are the only ones involved with genealogy. Both of us are very active researchers, publishing, etc. The father of our 3-G Grandfather remains a mystery, and we have no living males for a yDNA test. But because of our constant work, we have not only become acquainted with many cousins, but have helped discover their ancestral lines. It is a worthy endeavor! Good post Michael, and I agree with you – we all contribute to history, and we all deserve to be remembered. And yes, all of our histories begin at home. For the record, Philip O’Dwyre is listed as Philip O’Dwyer on Findagrave memorial # 15167596, and he is the only O’Dwyer listed on Findagrave as being buried in this cemetery and in this town. It would appear there may be many O’Dwyers missing from Findagrave. I should note that the original Findagrave memorial owner (Marie Bonafonte) has apparently relinquished control over this memorial and many other of her own 45,872 Findagrave created memorials. I suspect that she may be getting on in years, or simply may have other responsibilities that prevent her from actively supporting all of her own memorials. Regarding the O’Dwyers, from your article above, I perceive there may be many other O’Dwyer burials in Saint Joseph Cemetery, and likely many more buried under various other married family names. A project to make Findagrave accurate for the O’Dwyer family might take a bit of time, unless much or all of that family research has already been done (which I suspect may be the case). 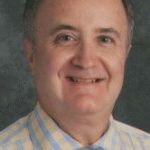 I am a Findagrave member and photographer and am quite willing to submit edits to the Philip O’Dwyre memorial owner (FindaGrave at this time), and post the photograph you attached, and using the information you posted above. I don’t like to make Findagrave modifications unless they are substantiated with backup material. Depending on the nature of any additional supporting material you are able to provide, I may be able to help create the other missing O’Dwyer memorials on Findagrave. Obviously, much of the accuracy of how the O’Dwyers are represented on Findagrave is going to be also dependent on reconciliation with actual cemetery records, and I’m wondering if you have contacted Saint Josephs Cemetery for verification and addressing locations of the family’s burials. And yes, I know that this type of cemetery connection and verification sometimes takes time and effort as not all cemetery records are current, accurate, and/or readily available to the public. So, I’m willing to help improve O’Dwyer family accuracy on the Findagrave side of things if you are interested. You may contact me at ‘johns@highlander.com’ if you want to pursue the matter further. And Merry Christmas to you and yours. BTW, it appears that, because of the dates involved, the Philip O’Dwyer on Findagrave memorial # 15167596 I referenced above, must be Philip junior’s memorial, not that of the original Philip O’Dwyre. That being the case, there is no Findagrave memorial for the father, and thus more attention should be placed on examination of the cemetery records when trying to make the Findagrave database more accurate. The whole family needs to be reviewed carefully. Thank you, John, for your detailed response and for the encouragement to follow through. I did visit the cemetery office at St. Joseph’s Cemetery and can reconcile the names and dates. I will be in touch. Excellent. Ho-ho-ho – Merry Christmas! Michael, come on now, you need to get everyone listed on the O’Dwyre monument set up on Find-A-Grave before the new year! And don’t forget to cross reference it to Dwyer! I will do that, Bruce.A good way to start the news year. Preparing to write this post made me delve into my own archives and retrieve the photo, plus others that I took twenty years ago. HI Michael Dwyer, Thank you for this lovely post. My grandma was Ella Dwyer, who lived to be 101, and had many stories to tell about our Dwyers from Tipperary. A cousin, Frank, has taken the Y-DNA test, and there are various Dwyers and O’Dwyers trying to advance our understanding of the history of the O’Dwyers by connecting us through Y-DNA. If you, or one of your Dwyer male relatives, hasn’t taken a Y-DNA test yet, it would be a wonderful thing if you would consider it! Thanks for your many articles on this blog! Thank you, Maureen, for your comments. According to family lore, now validated by DNA, the Dwyers do hail from Tipperary. With the dearth of Irish Catholic records before 1820, there is so much genealogy to be retrieved. I would appreciate contact information on your cousin Frank. I also agree! I have “adopted” an heirless person to do his genealogical write up. Let these people not be forgotten. There is no reason to not remember family. Would those genealogy colleagues walk up to a childless aunt or uncle and say to their face that once they die they will be forgotten because without children their lives are meaningless? Every life affects those around them they should not be forgotten. I agree. My quest is documenting the unmarried or childless, and often forgotten members of the family. Michael, What an enjoyable post! But surely any eminent genealogist who states that ” there is little point in publishing information on families with no living descendants” rather misses the point of the study itself – and likely doesn’t smile at strangers passing by, or ever rescue a stray dog either. Kudos to you for giving this family a voice! Hello, I think it is our duty as genealogists and family members to remember those who have no descendants. My grandfather had 4 siblings, 2 sisters and 2 brothers, who were all very dear to the family, but never had children. Of that number only one brother married. My grandfather, on the other hand, married, had 6 children and 33 grandchildren, and who knows how many great and great, great grandchildren. These Great Aunts and Uncles took great interest in all of us, were present at many life events, and in later life were rewarded with care and love in their last years by many of us. Their memories are preserved in our family genealogy and for now in the many, wonderful memories of the great, grandchildren. So true, and worthy of remembrance. It surprises me to hear anyone make such a comment, as there are multiple reasons why individuals might be interested in that families information. For genealogists, the family might not a direct descent, but may be useful as a friend or neigbor. In more specific cases, the data could be of vital importance to an individual working on one-name or one-place studites. Outside of genealogy, collectors might be interested in the information. My dad’s cousin collects 18th and 19th century American ceramics, and he and his wife enjoy doing extensive research into the families who owned every piece buy. Just more reasons for this information!